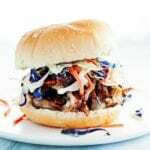 Tender, flavorful, delicious pulled pork. Tossed in barbecue sauce and served on toasted buns. Add a side of carrot fries, mac and cheese, coleslaw, or corn on the cob for a delicious and complete dinner recipe. Pat roast dry with paper towels and place into a baking dish. Mix spices together and rub on roast, coating all surfaces. Cover roast with plastic wrap and refrigerate overnight. An hour before cooking, remove roast from the refrigerator, unwrap, and let sit at room temperature. Cook roast uncovered for 3 hours. Cover with aluminum foil, and cook for an additional 2 hours. Let roast rest for at least 1 hour before serving. When roast has finished resting, use hands or forks to shred pork, setting aside large fat pieces. Toss in barbecue sauce. Serve on buns with extra barbecue sauce. *use a bottle of your favorite barbecue sauce or try making one from scratch like in my barbecue meatballs recipe.